Essential for life, food and fluids are regarded as basic care, professionally, ethically, and legally. 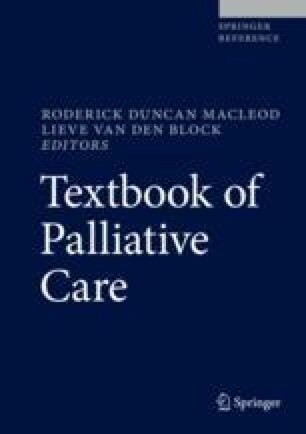 This chapter seeks to contextualize and explore the significance and meaning of compromised nutrition and hydration in contemporary adult palliative care. The internationalization of Western medicine, Western bioethics, and palliative care generates new perspectives and can challenge established practices. It is important that evidence of the relevance, efficacy, and appropriateness of artificially intervening in the natural course of terminal illnesses is developed; however, that knowledge will not necessarily resolve the issues associated with the reality that food and fluids mean different things to those involved. Universally, food and fluid, its preparation, use, symbolism, and value are inherently meaningful. Discussions, opinions and decisions vary regarding supporting oral intake, and clinically assisted nutrition and hydration, particularly towards the end of life. Inevitably, the perspectives of the ill person, their companions, and informal and professional caregivers are not necessarily consistent or static. Endeavors to address declining oral intake must be individualized, congruent with care goals, and cognizant of cultural values, religious, and personal beliefs. It is an aspect of care (and dying) that should not be taken for granted nor considered problematic. Rather, it is inevitable for many people and no lasting resolution should be anticipated or desired. Professional knowledge and curiosity towards the multiple meanings surrounding eating, food, nutrition, and hydration, and their meaning is the proposed aspiration. Ivanović N, Büche D, Fringer A. Voluntary stopping of eating and drinking at the end of life – a ‘systematic search and review’ giving insight into an option of hastening death in capacitated adults at the end of life. Br Med J Palliat Care. 2014;13(1):1–8. http://www.biomedcentral.com/1472-684X/13/1. https://doi.org/10.1186/1472-684X-13-1.